First Night certainly presents revelers with lots of fun year-end options, but what if you’re looking for something a little more, well, kilted? Richmond steps up to the plate with “A Celtic New Year,” a second annual, multi-venue evening of Scottish and Irish-influenced folk. More than 20 performing groups include the Highland Weavers, the Fiddleheads, Middlebury-based trio O’hAnleigh, and bagpipers playing two different types of drone-driven instruments. Scottish dancers don ghillies to jump over swords, and the Mandolinquents trace the musical relationship between Celtic ballads and bluegrass. Two more reasons to put on the plaid? Button sales for the community-organized nonprofit fund local youth-performing-arts programs, and a bonfire-enhanced “ball drop” warms up the midnight countdown. Buttons cost $10 through December 30, $12 on December 31. Kids 5 and under free. Buttons and programs are available in advance at various locations and on December 31 at the following First Night venues: Montpelier City Hall, City Center, Union Elementary School, Christ Church, and the Central Vermont Civic Center (last location from 1-3 p.m. only). Info, http://www.mcda.org or call 223-9604. FREE SKATING: Central Vermont Civic Center, until 3 p.m.
5K ROAD RACE: Starts at the Pavilion Building, registration begins at 1:30 p.m.
GREEN MOUNTAIN YOUTH ORCHESTRA: City Hall Auditorium, until 3:45 p.m.
DAVID KRAUS & JOHN LAROUCHE: Bethany Church Sanctuary, until 3:45 p.m. THE RESTORE’S HAT-MAKING WORKSHOP: Bethany Church Hall, until 5:45 p.m.
SPENCER LEWIS: Singer-songwriter. Christ Episcopal Church, until 3:45 p.m.
BILL SHONTZ: Union School Auditorium, until 3:45 p.m.
APPLE BLOSSOM PUPPETEERS: Kellogg-Hubbard Library, until 3:45 p.m.
GORDON STONE BAND: Trinity Church Sanctuary, until 3:45 p.m.
AMAPOLA: Latin American vocal music. Unitarian Church Sanctuary, until 3:45 p.m.
KRISTINA STYKOS & DOUG PERKINS: St. Augustine’s Parish Hall, until 3:45 p.m.
INTERNATIONAL FOOD COURT: City Center, until 8 p.m.
MARKO THE MAGICIAN: City Hall Auditorium, until 4:45 p.m.
CODY MICHAELS: Original piano compositions. Bethany Church Sanctuary, until 4:45 p.m.
MARK LEGRAND & THE LOVESICK BANDITS: Christ Episcopal Church, until 4:45 p.m.
BILL SHONTZ: Union School Auditorium, until 4:45 p.m. DAMN YANKEE STRING BAND: Kellogg-Hubbard Library, until 4:45 p.m.
STONE, COANE & SACHER: Trinity Church Sanctuary, until 4:45 p.m. THE BARN BAND: Unitarian Church Sanctuary, until 4:45 p.m.
MONTEVERDI MUSIC SCHOOL: Unitarian Church Vestry, until 4:45 p.m. OASIS MIDDLE EASTERN DANCE: St. Augustine’s Parish Hall, until 4:45 p.m.
LASAGNA DINNER: Trinity Methodist Church Fellowship Hall, until 7 p.m.
CHILI SUPPER: Bethany Church Fellowship Hall, until 7 p.m.
MARKO THE MAGICIAN: City Hall Auditorium, until 5:45 p.m.
FYRE & LIGHTNING CONSORT: Bethany Church Sanctuary, until 5:45 p.m.
PATRICK FITZSIMMONS: Christ Episcopal Church, until 5:45 p.m.
ANN WHITING & FRIENDS: Union School Auditorium, until 5:45 p.m.
CHILDREN GATHER ROUND: Union School Gym, until 5:45 p.m.
JENNINGS & PONDER: Kellogg-Hubbard Library, until 5:45 p.m.
STARLINE RHYTHM BOYS: Rockabilly honky-tonk. Trinity Church Sanctuary, until 5:45 p.m.
WAGTAIL: Kitchen junket tunes. Unitarian Church Sanctuary, until 5:45 p.m. OASIS MIDDLE EASTERN DANCE: St. Augustine’s Parish Hall, until 5:45 p.m.
GREAT BROOK BLUES BAND: City Center, until 7:30 p.m.
CATAMOUNT PIPE BAND: City Hall Auditorium, until 6:45 p.m.
MICHAEL ARNOWITT: Classical piano. Bethany Church Sanctuary, until 6:45 p.m.
BLUE FOX: Christ Episcopal Church, until 6:45 p.m.
VERMONT FIDDLE ORCHESTRA: Union School Auditorium, until 6:45 p.m.
CHILDREN GATHER ROUND: Union School Gym, until 6:45 p.m.
WOODCHUCK’S REVENGE: Kellogg-Hubbard Library, until 6:45 p.m. ANYTHING GOES: Trinity Church Sanctuary, until 6:45 p.m.
WAGTAIL: Kitchen junket tunes. Unitarian Church Sanctuary, until 6:45 p.m.
WORDSTAGE: Unitarian Church Vestry, until 6:45 p.m. COLD COUNTRY BLUEGRASS: St. Augustine’s Parish Hall, until 6:45 p.m.
SPECIAL ACTIVITIES: Games & crafts. Basement Teen Center, until 7:45 p.m.
VERMONT PHILHARMONIC ORCHESTRA: City Hall Auditorium, until 7:45 p.m.
SHEEFRA: Bethany Church Sanctuary, until 7:45 p.m.
JAY EKIS: Christ Episcopal Church, until 7:45 p.m.
PANASHE STEELBAND: Union School Auditorium, until 7:45 p.m.
LEWIS FRANCO & DAUGHTER: Acoustic folk. Kellogg-Hubbard Library, until 7:45 p.m.
NISHT GEFERLACH KLEZMER BAND: Trinity Church Sanctuary, until 7:45 p.m.
RUSTY ROMANCE: Roots-rock music. Unitarian Church Sanctuary, until 7:45 p.m. COLD COUNTRY BLUEGRASS: St. Augustine’s Parish Hall, until 7:45 p.m. PARADE AND FIREWORKS: City Center. DANCE PARTY WITH BLUE FOX & THE ROCKIN’ DADDIES: City Hall Auditorium, until 10 p.m.
‘IMPROVISIONS’ WITH MICHAEL ARNOWITT: Bethany Church Sanctuary, until 11 p.m.
POETRY SLAM COMPETITION: Bethany Church Hall, until 11 p.m.
LOST NATION THEATER CABARET: Unitarian Church Vestry, until 10 p.m.
SPECIAL ACTIVITIES: Games & crafts. Basement Teen Center, until midnight. DANCE PARTY WITH TAMMY FLETCHER & THE DISCIPLES: City Hall Auditorium, until midnight. LOST NATION THEATER CABARET: Unitarian Church Vestry, until 11 p.m. MIDNIGHT COUNTDOWN & BALLOON DROP: City Hall Auditorium. Cold, dark nights are the perfect time to settle down for stories by the fire. Tim Jennings and Leanne Ponder get to the heart of what makes tales worth telling, and listening to: The pair has been reciting original and traditional narratives around New England for more than 20 years. Their 2006 album Wolves! 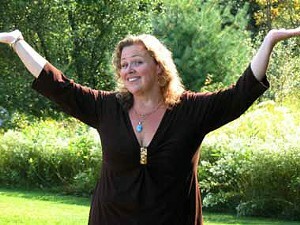 won multiple awards for its kid-friendly, spoken-word world tour of legends about dogs gone wild. 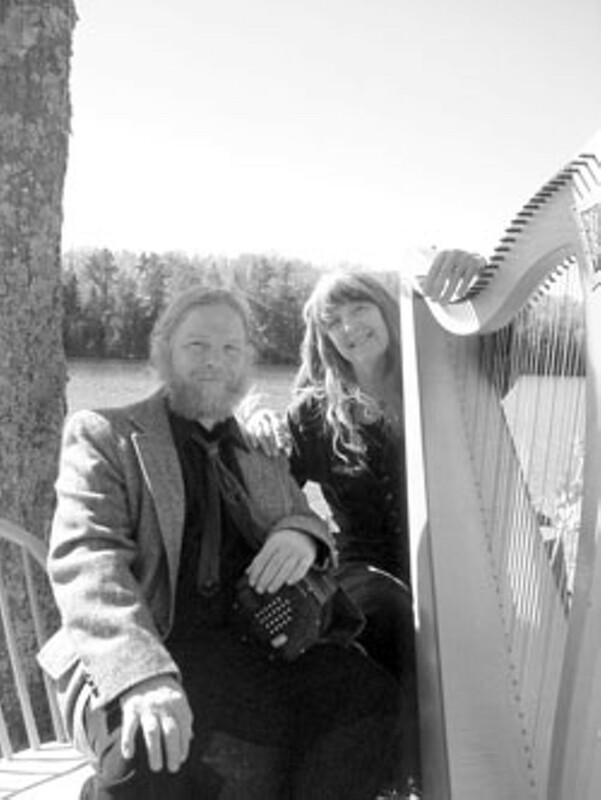 Catch them spinning yarns or striking chords - they also perform bardic Irish and Scottish melodies from memory as harp and concertina duo Sheefra. Sheefra, Bethany Church Sanctuary, 7-7:45 p.m.